You've found the “U.S. 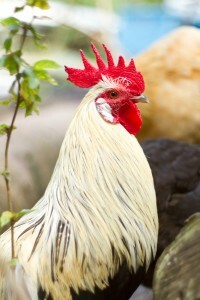 Phoenix Chicken Breeders” page here at Hobby Farm Wisdom! If this is the first time you have visited our site: Welcome! Phoenix chickens are a German breed that was originally developed by crossing the Japanese Onagadori with locally available birds. The result was a bird that is commonly kept for ornamental purposes, although the hens are good layers of small to medium sized eggs. Phoenix chickens are a long-tailed breed that resembles pheasants, with tails that reach up to 2 – 3 feet in length and molt every two years. They are active birds best suited for free ranging, especially for optimal tail growth. If kept in confinement, other birds will step on and limit the tail growth. While there are a large number of color varieties, only silver, golden and black-breasted red are accepted by the APA.